R.O. Anderson collected all available AutoCAD drawings, as well as hard copy record drawings of the District’s collection system, and organized them into a single AutoCAD compatible drawing file. The survey crew then undertook the task to precisely locate all above ground infrastructure, manholes, valves, service lines, and lift stations using a GPS data collection receiver. In areas where GPS did not yield such accuracies (e.g. heavy tree canopy, obscured sky, etc.) conventional surveying techniques were used to meet an identical accuracy standard for those locations. R.O. Anderson also coordinated the contract and services for high-resolution orthorectified photogrammetry which was incorporate into the field-grade survey data to locate existing facilities, including both rim and invert elevations of gravity facilities, necessary to prepare district-wide mapping. Through the United States Department of Agriculture, the Natural Resources Conservation Service (NRCS), provides incentives to farmers, ranchers and forest landowners wanting to put wetlands, agricultural land, grasslands and forests under long-term easements. 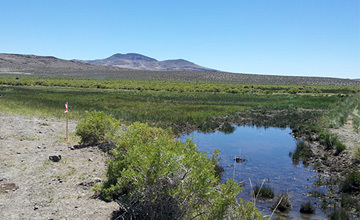 Within the State of Nevada, NRCS was seeking a Surveyor for the State of Nevada to assist NRCS with land surveying services for selected easement purchases through the Grasslands Reserve Program and Wetland Reserve Program, as well as for easements for the protection of sage grouse, which was recently listed as a Threatened and Endangered Species. 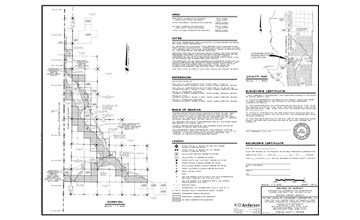 Administration of these programs within rural Nevada offers a unique set of challenges with respect to surveying. Due to the rural and remote nature of these ranches, many have not had the need for a boundary survey previously. R.O. 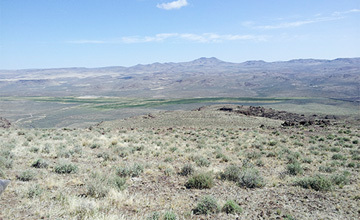 Anderson was selected in 2012 as the Natural Resources Conservation Service’s (NRCS) Surveyor for the State of Nevada. Our primary functions include coordination with the private land owners and NRCS to survey acreages of the ranches, placement of easement signs and corners to identify the location of the easements, calculation of acreages for easements, and preparation of legal descriptions and exhibits. Through the retracement of historic surveys and records, our surveyors will locate and identify historic boundary markers often comprised of a pile of rocks or a fence post in order to obtain acreages for current easement acquisition. Under the five year contract, R.O. Anderson surveyors will assist NRCS with land surveying services for selected easement purchases. As a result, we have conducted numerous surveys statewide resulting in the preservation of thousands of acres of habitat. The Kirkwood Meadows Public Utility District (KMPUD) needed a new 27.7-mile underground power line linking the PG&E Salt Springs Reservoir hydro-generation facility to the KMPUD Blue Substation at Kirkwood Mountain Resort. 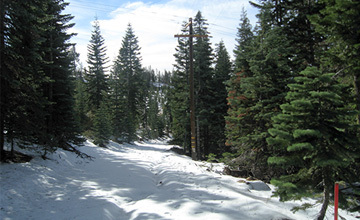 Located at the Sierra Nevada crest in the Alpine, Amador, and El Dorado counties of California, this project is significant to the entire Kirkwood region since it relied solely on a diesel generator as the power source for the entire community. With high elevations, mountainous terrain, limited vehicular access, and a persistent late season snow with slow snowmelt, substantial challenges were presented for a survey project requiring significant fieldwork. Having enjoyed a strong relationship as the primary surveyor for Kirkwood Mountain Resort since 2006, R.O. Anderson was engaged to assist KMPUD with this significant project. R.O. Anderson undertook an ambitious project schedule and began by verifying the existing LiDAR control network on the California Coordinate System, using both GPS and traditional survey methods. Traditional methods were necessary because the terrain made GPS observations very difficult and the presence of trees hindered GPS satellite reception. R.O. Anderson surveyors provided accurate and complete survey grade control for the entire length of the route to be used as a basis for all subsequent tasks. Utility lines were also field located along the entire length of the route. In addition to the control network, R.O. 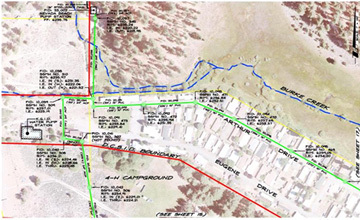 Anderson performed a comprehensive topographical survey for four distinct areas where the power line had been rerouted from the original proposal and contour data was unavailable. The survey was instrumental in successfully completing the power line extension. Edgewood Water Company is a private utility that is the purveyor of community water services for the Casino properties and golf facilities located in Stateline, Nevada. The facilities are located within the Tahoe basin, which subjects the Company to the environmental regulations administered under the Bi-State compact between California and Nevada, administered by the Tahoe Regional Planning Agency. 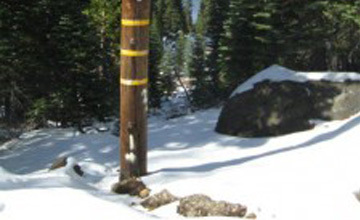 The Company’s facilities have been in place many years and as with other utilities, their exact location of these facilities is unknown and can be problematic for winter repairs within this alpine environment. R.O. 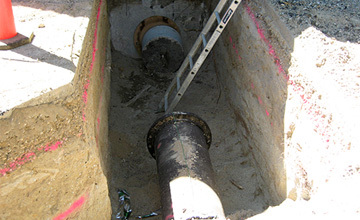 Anderson was retained by Edgewood Water Company in Stateline, Nevada, to complete a utility mapping project of the existing water infrastructure, storage tanks, and the water treatment plant for the community’s water system. Our survey crew worked closely with the utility manager to ensure the most accurate locations for water lines, water valves, and fire hydrants were obtained. The survey crew utilized both a GPS data collection receiver, as well as conventional surveying techniques to collect field data. R.O. 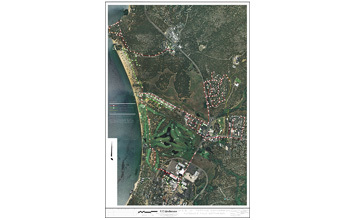 Anderson incorporated all field data, along with existing aerial photography into an electronic mapping database in AutoCAD. Additionally, R.O. Anderson incorporated all existing AutoCAD drawings into this single AutoCAD database. Where electronic files did not exist, R.O. Anderson digitized existing hard copy record drawings for inclusion into the database. A hard copy report of the water infrastructure system map was also delivered for Edgewood Water Company’s use and display. In 2004, a LIDAR topographic survey of the Carson River corridor was produced for Carson Water Subconservancy District (CWSD) by BAE Systems/Woolpert. The purpose of that survey was to develop topographic information for river restoration projects to be developed along the Carson River. 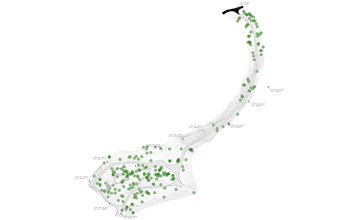 Although the contractor provided an estimate of vertical accuracy of the resulting dataset, the number of points used for the assessment was limited (less than 20 points). In 2009, we were contracted to perform a quality-assurance survey to determine whether the vertical accuracy was sufficient to comply with FEMA standards. R.O. Anderson performed the survey tie-in of the BAE System Network to recover and survey the control points used by the BAE Systems contractor to establish their control network. Verification of the ability to recover and verify the coordinates used for the control network for the LIDAR survey was an important step in the validation of the LIDAR dataset. R.O. Anderson performed field survey work to collect required data. We then extracted elevations from the LIDAR dataset. ARC-Map was used as the tool for processing the LIDAR dataset and for construction of a terrain model of the Carson Valley portion of the dataset. The horizontal locations of the field surveyed points were used to extract an elevation from the LIDAR-based terrain model. These elevations were used for comparison with field surveyed elevations to assess the vertical accuracy of the LIDAR topographic dataset. These elevations were used for comparison with field surveyed elevations to assess the vertical accuracy of the LIDAR topographic dataset. A comprehensive report was prepared to document the results and compute the vertical map accuracy of the LIDAR-based topography. Computation of the differences residuals between the LIDAR-based elevations and the field-surveyed elevations was completed, then RMSE for validation of the LIDAR-based elevations was computed. Since completion of the Carson Valley LIDAR Validation, R.O. Anderson has been engaged by CWSD to perform a similar validation in Carson City and Lyon County. This LIDAR Validation project spans over 80 miles and involves more than 10 different public entities.